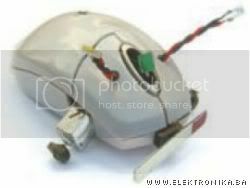 Here you will se a little light-following robot made in a housing of an old PC mouse. It moves around thanks to the two DC motors which are controlled by LM386 OpAmp and two light sensors. When the robot hits the obstacle it changes direction. This was on Make in year 2007, but still it's cool for beginners.